Iconic designer Michael Kors is one of the top names in American fashion, with fashion forward styles and bold designs. This women's watch from the Slim Runway collection features a two-tone Stainless Steel bracelet and silver dial. I've want a two toned watch for a while, saw this one on Overstock. It's bigger than it looks in the photo, too big for my small wrists. I did not send back gave to my daughter who loves it. Good looking watch but really large face and band. I have smaller sized wrists and the watch face was wider than my wrist. In addition, there was no way to take out enough links in the band to fit. This says it's a women's watch and I bought it for my stepmom. It was too large a face although the band is slim. So I ended up giving to my husband who likes it for an everyday work watch. It looked too large, more of a man's looking watch besides being too large, I sent it back. My daughter's birthday is also fast approaching. She's an huge MK disciple. Her first MK watch from a few years ago had a lot of 'bling'. 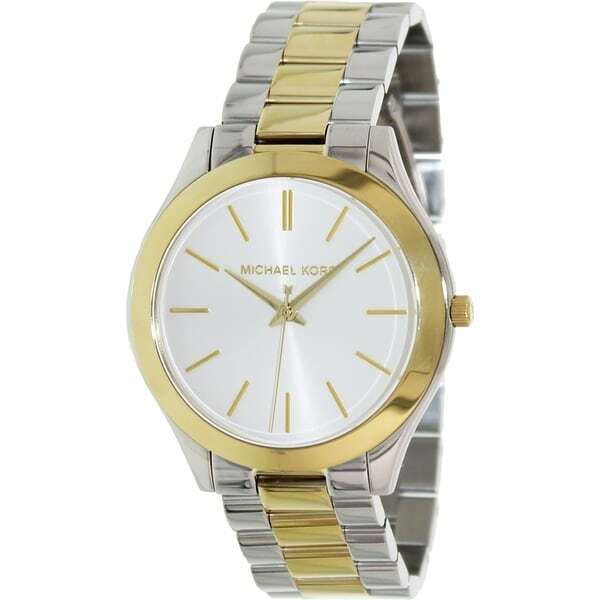 Now that she's working in a conservative work environment, I think this watch is classier and it's still MK.